Winner of the "Best American Cheese" award at the World Cheese Awards, Harbison is a creamy, spruce bark wrapped cows’ milk cheese. Harbison makes its debut each year in the early summer when the cows’ milk is bountiful and full of rich grassy flavors. The wheels are characterized by a sweet milky flavor, and finish with meaty, smoky, juniper notes that are imparted via the bark, which is harvested from the surrounding forest. Aged for 45-60 days and made from pasteurized cow's milk. To serve, cut off the top of the wheel and dip or scoop away! 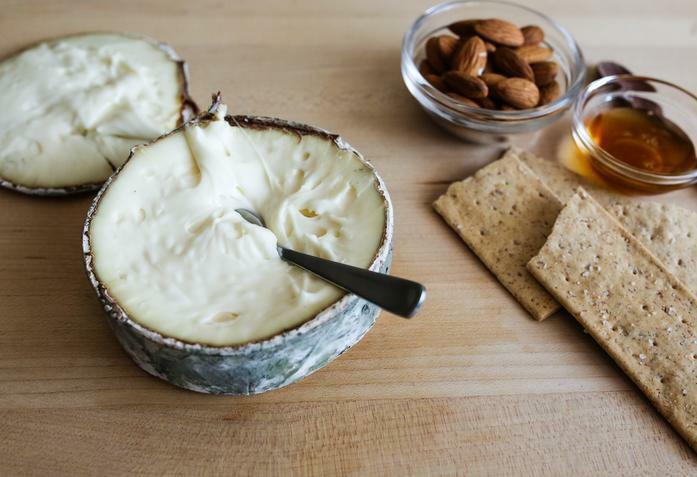 Produced by Jasper Hill Farms, one of the finest dairy producers and creameries in the Northeast. All of Jasper Hill's animals are pastured when the weather allows an supplemented a diet of GMO-free grain.